The HTR ZIII is well suited to high performance, luxury sports cars and sedans. The asymmetric, 5-rib pattern with stiffer outer blocks provides excellent high-speed stability and control, while the advanced silica tread compound and groove design enhance wet weather performance and help reduce irregular wear. Asymmetric 5-rib pattern Achieves high speed stability thanks to the asymmetric pattern with stiffer outer blocks designed to withstand increased centrifugal forces and inner blocks to provide excellent straight handling stability. Lateral grooves Long lateral grooves contribute to clearing water from the centre rib to the outer blocks during cornering. Irregular wear control rib The irregular wear control rib works to reduce irregular wear on the inner shoulder blocks. 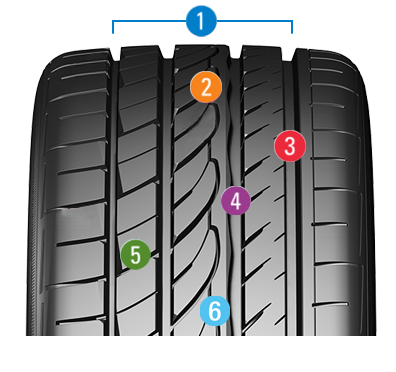 Wide and straight grooves Four efficient wide and straight grooves located in the tread area enhance wet performance. In tire-bar sipes Control shoulder block stiffness to reduce irregular wear and keep draining water as the wear progresses to ensure consistent wet weather handling. 3D Wave-wall Ensures water drainage and minimises centre rib movement for excellent handling response.